I thought I’d do a three part series on Mongolian music, using YouTube videos that I’ve found, and starting with three traditional forms- khoomii (throat singing), Urtyn Duu (long song) and morin khuur (horsehead fiddle). Next week, it will be Mongolian musicians and singers performing in western musical genres like rock and the third week will be music that is a synthesis of the first two. You can read more about Mongolian music here. 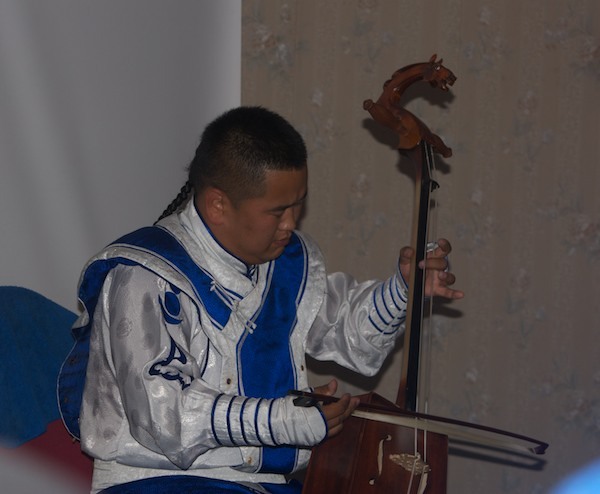 Khoomii may the musical form best known by westerners due to a number of “folk” CDs available that feature throat singing, which originated in western Mongolia in an area just to the south of the Khar Us Nur lake complex. Urtyn Duu means “long song”, but not that the songs themselves are long. The name refers to the singer stretching out the syllables of the words. Although both genders sing this form, the most famous long singers seem to be women. Morin Khuur is the horsehead fiddle, probably the most famous Mongolian musical instrument and is one of the symbols of the country. With only two strings, the player can create truly beautiful musical sounds and also perfect imitations of the sounds that horses make. The selection in the video is one of my most favorite pieces of Mongolian music, “Mongolian Melody” by one of Mongol’s most esteemed composers, Jantsannarov. Getting Ready For The Big Cat Quick Draw On Sept. 17- Cheetah Studies!